Egret standing at the shoreline on a summer day. 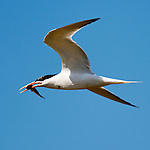 Tern Feeding Chicks 1, Bolsa Chica, CA. Egret looking for Fish, Upper Newport Bay, CA. Egret at the water's edge. Pelican 1, soaring at Bolsa Chica, CA. Fish in mouth, an egret escapes a seagull. Seagull in Seal Beach, CA. White pelicans, Bolsa Chica State Park. Egret Pose, Balboa Island, CA.